UNITED NATIONS, Jun 30 2015 (IPS) - In 2013, an estimated 240,000 children were born with HIV. This was an improvement from 2009, when 400,000 babies tested positive for the infection, but still a far cry from the global target of reducing total child infections to 40,000 by 2015. Bucking the global trend, one small island nation has made gigantic strides towards the 2015 goal. That country is Cuba, and in 2013 it recorded just two babies born with HIV. 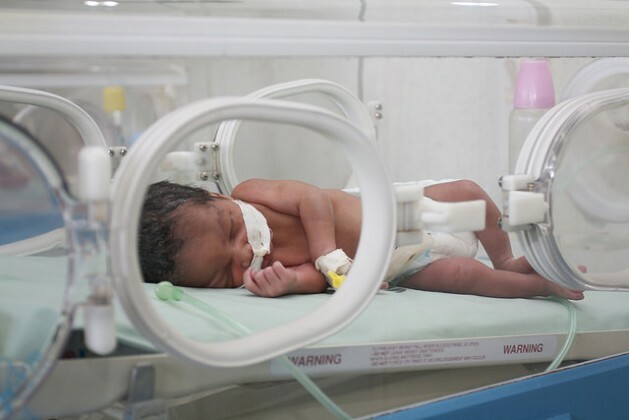 Today, Cuba has become the first country in the world to receive validation from the World Health Organisation (WHO) that it has eliminated mother-to-child transmission of HIV and syphilis. Every single year, over 1.4 million women living with HIV become pregnant. Without proper treatment, they run a 15-45 percent chance of transmitting the virus to their kids – during pregnancy, labour, delivery or breastfeeding. But if both mother and child receive proper antiretroviral treatment, the risk of transmission falls to just one percent. Since 2010, the Pan American Health Organisation (PAHO), which serves as the Regional Office for the Americas of the WHO, has been working with its partners in Cuba and other states in the region to roll out a comprehensive programme to eliminate mother-to-child transmission of both HIV and syphilis. This process has involved improving early access to prenatal care, testing for pregnant women and their partners, caesarean deliveries and substitution of breastfeeding. Such services were undertaken and provided within the larger framework of equitable access and universal healthcare, in which maternal and child health is integrated with programmes to combat sexually transmitted diseases. “Cuba’s success demonstrates that universal access and universal health coverage are feasible and indeed are the key to success, even against challenges as daunting as HIV,” PAHO Director Carissa F. Etienne said in a statement on Jun. 30. “Cuba’s achievement today provides inspiration for other countries to advance towards elimination of mother-to-child transmission of HIV and syphilis,” she added. WHO and its partners first published comprehensive guidelines on the processes and criteria for validation of eliminating mother-to-child transmissions in 2014. Because treatment and prevention can never be 100 percent effective, ‘elimination’ is defined as “a reduction of transmission to such a low level that it no longer constitutes a public health problem”, according to PAHO. In March of 2015, a group of international experts visited Cuba to assess its progress towards the elimination target, and spent five days visiting health clinics, labs and government institutions interviewing a range of experts and other stakeholders. Comprised of experts from 10 countries including Argentina, Japan and Zambia, the mission considered a number of indicators – all of which must be met for at least one year – including confirming that new child infections as a result of mother-to-child transmissions are less than 50 cases per 100,000 live births. Other indicators, which must be met for at least two years in order to receive validation, include ascertaining that more than 95 percent of HIV-positive women know their status, receive at least one ante-natal visit, and receive antiretroviral drugs. “Eliminating transmission of a virus is one of the greatest public health achievements possible,” WHO Director-General Margaret Chan announced on Jun. 30. “This is a major victory in our long fight against HIV and sexually transmitted infections, and an important step towards having an AIDS-free generation,” she added. According to the World AIDS Day 2014 Report, there were 35 million people living with HIV/AIDS in 2013. Since the start of the epidemic in the 1980s, 39 million people have died of AIDS-related illnesses and close to 78 million have become infected with HIV. Thanks to sustained local and global efforts to fight the epidemic, the death toll has fallen significantly in the past decade, from 2.4 million deaths in 2005 to 1.5 million in 2013, representing a 35-percent decline. New infections have also declined by an estimated 38 percent since 2001, from 3.4 million to 2.1 million in 2013. Among children, new infections have fallen from an estimated 580,000 in 2001 to 240,000 in 2013. If more countries emulate Cuba’s example, the international community will be closer to its 2015 goals, and the ultimate goal of eliminating AIDS altogether.